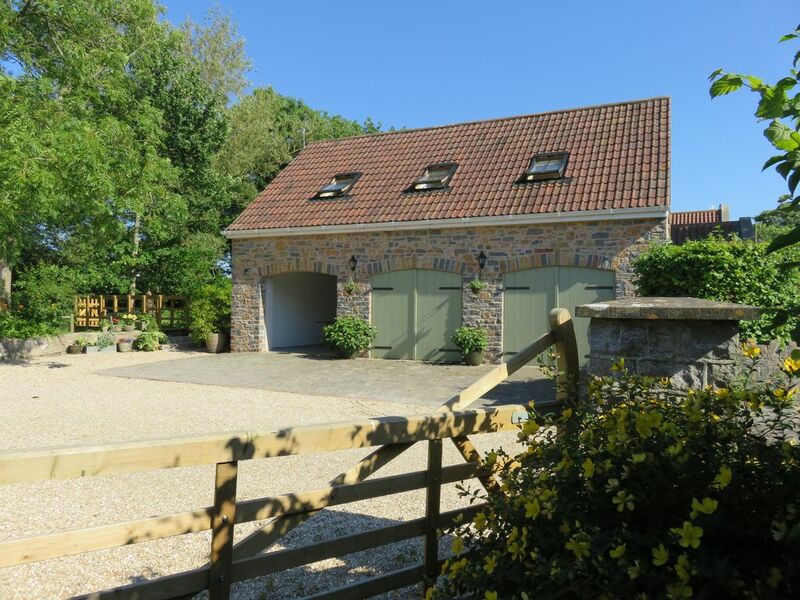 Beautiful stone built coach house, nestling at the foot of the Mendips with many wonderful walks straight from the door. The Coach House was built in 2012 in the grounds of the owners' own home, but far enough away, so privacy is always maintained although we are more than happy to help with any queries that our guests may have. The front door opens onto a small entrance hall containing a sink (for washing those muddy boots after walks) and a washing machine, together with ample storage cupboards containing iron, ironing board and pegs for the clothes line just outside the coach house. There is also a small freezer in this area for guests' use. The rest of the accommodation is on the first floor, reached by an internal staircase. There are two comfortable bedrooms, one with a new king size bed and a wash hand basin and the other with two single beds. There are blackout blinds in both bedrooms ( as well as curtains) for a great night's sleep. There is a stylish shower room with velux window and a large beamed living area containing fully equipped modern kitchen including Nespresso coffee machine and milk frother and sitting area with picture window overlooking the beautiful garden. Outside to the side of the Coach House, there is a wooden table and chairs (and parasol) where you can enjoy a morning coffee or evening glass of wine, This is situated next to the Langford Brook, which runs through the garden. There is a wooden bridge giving immediate access to the garden and guests are very welcome to explore the garden, and the few chickens and ducks are always happy to be thrown your food scraps! When available, guests may collect the eggs. There is a table tennis table in the covered area next to the door to the Coach House, which guests are welcome to use. There is ample parking space next to the Coach House. The property is situated in Lower Langford, a pretty village with amenities such as a local, popular, pub and a well-stocked supermarket and petrol station, both of which are open 24 hours a day. There are the historic cities of Bristol, Bath and Wells, all within 45 minutes drive or less, with their many attractions. For those with children, there are many child friendly visitor attractions in the area, such as Court Farm Animal Park, or Noah's Ark Zoo Farm. Because we live nearby, we are able to be on hand to answer any queries you may have, and to suggest places to visit and things to do. If, however, you prefer to make your own discoveries, we will not intrude. We want you to have a wonderful time in this idyllic part of Somerset. My husband and I chose to live in this idyllic part of Somerset 18 years ago in order to be near Bristol where we both worked at the time. Now, neither of us work there and our younger daughter will soon finish school in Bristol, but we love being in the countryside but within about half an hour of Bristol, Bath and Wells. The accommodation is mainly on the first floor of a stone built coach house. It shares a driveway with our home, which is about 40m from the coach house, but far enough away to give you complete privacy. Obviously, we are more than happy to help or answer any questions you may have. Our home and the coach house are situated in a large garden, with orchard, ducks and chickens which guests are very welcome to enjoy. We moved here in 1997 when our first daughter was due. The Coach House was built in 2012. The space on the ground floor is used for storing garden furniture, BBQ, bikes and table tennis table with the Coach House on the upper floor to take advantage of the splendid views. Our house is situated about 100ft away from the Coach House. We love living here - it is easy to get to Bristol,Bath, Wells or the coastal resorts of Clevedon and Weston-super-Mare to name but a few. The walking is superb with the Mendips literally on our doorsteps. Golfers are spoilt for choice, and mountain biking and riding is popular around here too. We have fantastic cycle tracks nearby such as The Strawberry Line along a disused railway line linking various villages with pubs and coffee shops en route. There is a fully fitted new kitchen, but if you don't want to cook, there is a very good local pub, The Langford, within 5 minutes walking distance, which serves local beers, wines and good food. There are other highly rated pubs in surrounding villages, a short drive or bike ride away. There is a well stocked medium sized supermarket, with petrol station, at the other end of the village. This stays open 24/7, so you never need to worry about running out of anything! We have a few chickens in a separate area of the garden, and we are happy for you to share the eggs. We know this area well, and are always happy to share our knowledge. One bathroom with shower, wc and wash hand basin; also wash hand basin in bedroom 1. Efficient modern cast iron radiators. Property very well insulated so doesn't ever feel very cold but very effective gas central heating freely available. Washing machine provided. No tumble dryer but clothes line outside and clothes rack provided to dry clothes in coach house. We are happy to dry large items in the house. Parking on private drive available next to coach house. There is a table tennis table downstairs that guests often enjoy and an exercise bike. We provide coffee, tea, sugar, milk, olive oil, herbs, pepper and salt, and usually a home made cake on arrival. We also provide lots of home grown fruit and vegetables when in season. Many exciting and varied novels available to curl up with. There is a large garden shared with us that guests are encouraged to explore and enjoy, as well as smaller private seating areas next to the coach house and over the private bridge on the lawn. Mendip Outdoor Pursuits are based in the vicinity and run day courses etc in many activities. We can advise you of popular cycle paths nearby, especially the Strawberry Line. There is a safe place to store your bikes. The Mendip Ski Centre with its very popular dry ski slope is within ten minutes drive of the Coach House. Here they have all sorts of adventure activities such as tobogganing for the little ones and outdoor pursuits for the young at heart! It is run by Mendip Outdoor Pursuits - look online to see all they offer. Tennis courts can be hired at reasonable rates at the nearby Churchill Sports Centre. There are various golf courses within 10-20 minutes drive of the property. It is up two short flights of stairs with a landing in the middle and a handrail. Notes on accommodation: Accommodation is particularly suitable for a family with slightly older children, ie not toddlers, as the accommodation is on the first floor. It is also suitable for two couples. Outside: The Coach House is located off a gravel drive looking over beautiful gardens bisected by a stream called "The Langford Brook". There are ducks and chickens for children to enjoy. There is outdoor wooden furniture and a BBQ that is solely for the use of Coach House occupants. The garden, which guests are welcome to enjoy, is accessed via a wooden bridge over the stream just adjacent to the coach house. Utility Room: Washing machine, sink for washing muddy boots, freezer, cast iron radiator, plenty of storage space. Cleaning / Towels / Linen / Maid service: Towels and linen are included. A well-appointed holiday cottage that makes excellent use of space. The picture window in the living area was glorious and offered a lovely opportunity to reflect on a day of sightseeing or energise you in the morning watching the birds and squirrels. The beds were comfortable and it was a boon having a sink in the double room, meaning we weren't needing to fight over the bathroom every morning and night! Liz and Rick were unobtrusive hosts and kindly provided us with welcoming supplies, and the area itself is a fantastic base. My friend and I have already decided we'll be back! Thank you for the glowing review. It was lovely to meet you and I’m glad you enjoyed your stay. It was just too short! I look forward to welcoming you back! A very clean and well maintained property. A nice quiet place to relax with very nice views out of the window. Liz left us some very nice treats upon our arrival which was very nice of her. To some up, Excellent!!! It was lovely to meet you both. I’m glad you had a nice stay at the Coach House. You’d be very welcome to come back anytime. Really nice place to stay and unwind. Garden is nice especially for children. Table tennis was a great little bonus. Owner had left treats for when we arrived, which is great after a long journey. Very Clean and well looked after. Thanks very much. It was a pleasure to have you stay. I’m glad you had a good holiday and enjoyed all the attractions local to us. Maybe see you back again sometime? You’d be very welcome. The location of this beautiful holiday home was very central to everywhere we wanted to visit. Liz was very helpful before and during our stay. Great for my son to go over the stream and see the chickens, play in the garden and pick flowers for his mum! Nice homely touches such as a bag full of games, DVD's, books, puzzles for the rainy days, use of bucket and spade, table tennis, lemon drizzle cake and a bottle of bubbly. Would definitely recommend staying here. Thank you very much for your lovely review, Susan. It was so nice to meet you and your family. I’m glad you had a good time and would love to welcome you back anytime. The apartment is beautifully presented, and has everything needed for a lovely holiday. Thank you Liz and Rick for your warm welcome and thoughtfulness. Thank you very much Suzanne. I’m so glad you enjoyed staying here. We loved staying here, so many small touches that make it so special. The attention to detail is excellent. Liz is a perfect host. I cannot comment on on any tourist visits as we used The Coach House as a welcome retreat each day whilst supporting our son in his golf competition. It is just heaven to sit and have a drink, whilst looking out of the picture window. The quality of the beds and linen ensured that we were all throughly rested. Liz does provide a folder too with all the local information in and of course she is literally just across the drive way from you, but never intrusive. I can highly recommend. Thank you for such a great review Lorraine! I like to provide things that I would be happy with if I were staying somewhere and it’s very gratifying when people appreciate them! I’m so sorry I didn’t meet you though I did say hello to your son. Maybe you’ll find your way back some day. You’d be most welcome. Both Bristol and Bath have many attractions - shops, galleries, pubs and restaurants. Bath is a World Heritage Site, known for its Georgian architecture and Roman Baths, its recently completed Spa (highly recommended for some rest and relaxation) not to mention its many festivals. Bristol is a city of balloons, boats, bikes, Brunel and Banksy. It has many attractions, including the Zoo, M Shed, Clifton Suspension Bridge to mention a few. We are about 30 minutes drive from Clevedon, a genteel Victorian coastal town with a magnificent pier. There are many stylish shops and cafes here and lovely Victorian architecture. Further afield (perhaps 40 minutes), there is Burnham-on-sea with a family friendly sandy beach. The world renowned beaches of Devon and Cornwall are just over an hour away (Devon) and two hours (Cornwall). Bristol Airport is very convenient - ten minutes drive away from the property. It is recommended that visitors have a car as public transport is time-consuming, although local buses do run through the village. All distances are by car. It is 35 minutes to Bristol, 45 minutes to Bath, 25 minutes to Wells, 30 minutes to Clevedon, 20 minutes to Weston-Super-Mare. The Mendip Hills are on our doorstep with many scenic walks, and there are many interesting villages in the area. There is a disused railway track, called the Strawberry Line, near to us, now used as a traffic free bike and walkers track, which is great for family bike rides between Yatton and Cheddar, with several cafes en route to aid tiring limbs! Also in the surrounding area are Cheddar Gorge, Glastonbury (home of the world famous festival), Tyntesfield (a glorious Victorian stately home now owned by the National Trust), Wells and Westonbirt Arboretum. Wells is England's smallest city because of its beautiful cathedral. There are lots of medieval buildings to admire, or to pause for a coffee or lunch, and the Bishops Palace and Garden surrounding the Cathedral is always a good place to stroll on a nice day. Locally, we have a pub within walking distance that does good food, with many more a short drive or bike ride away. We have a comprehensively stocked small supermarket and petrol station at the other end of the village that is open 24/7. We also have a farm shop with cafe bus attached. Booking Notes: Contact Liz by email with your requirements. I will aim to get back to you within 48 hours usually. I normally require 25% deposit on booking, then the balance within four weeks of your arrival date. Payment by bank transfer or cheque. We may also require a £100 breakages deposit, which we ask for at the time of the second payment. This will be refunded to you provided the property is left as you found it. Changeover Day: Saturday is our preferred changeover day, but we can be flexible, particularly out of busy season. The property should be ready by 1500 on the day of arrival and we would ask that the property is vacated by 1000 on the day of departure. Notes on prices: These rates include all bed linen, towels, final cleaning, all utility charges, parking and internet access. Longer stays, rates negotiable, especially during the winter. Cancellation Policy 50% refund for cancellations more than 30 days before check-in date. 100% refund for cancellations more than 60 days before check-in date.